When in the long course of Multiple Myeloma (MM) treatment is the best time to use CAR T therapy? Adam Cohen, MD, an assistant professor of Hematology-Oncology, identified T cell biomarkers that can predict response to CART-BCMA therapy in MM. In a companion abstract that will be presented in the same session, Ehren Dancy, MD, an internal medicine resident, showed that these same T cell biomarkers are more common in multiple myeloma patients who have only been through one line of therapy, indicating that CART-BCMA may be more effective for multiple myeloma if utilized earlier in patients’ disease course. The Abramson Cancer Center is currently testing the approach in a clinical trial. A trial investigating the combination of CAR T cells and the tyrosine kinase inhibitor ibrutinib in CLL patients showed a complete response rate of 43 percent of patients, as well as a bone marrow remission rate of 94 percent. At one year, 63 percent of evaluable patients still had undetectable leukemia in the marrow. “Our results suggest this combination is effective and that remissions are deep and sustained; we plan to further test this approach in a larger study,” said lead author Saar Gill, MD, PhD, an assistant professor of Hematology-Oncology. David Porter, MD, director of Cell Therapy and Transplantation, was the senior author on the study. A study led by Emily Ayers, MD, a fellow in Hematology-Oncology, assesses outcomes of patients who receive aggressive therapy for lymphoma, then relapse. Standard second line therapy is poor for many of these patients, and this study argues for more access to clinical trials as well as commercial CAR T products at this point in the treatment. “Why put these patients through an ineffective line of therapy when we know other options exist?” said senior author Daniel Landsburg, MD, an assistant professor of Hematology-Oncology. Landsburg is also the first author on a related study evaluating the high risk subtype of double expressor lymphoma patients who are unlikely to be cured with frontline therapy. That study shows clinical activity of ibrutinib in these patients, proving the BTK pathway – which ibrutinib targets – is active in the disease. Loss of CD19 is a known cause of CAR T relapse after initial response, but why are some patients’ resistant up front? Research from Nathan Singh, MD, a fellow and postdoctoral researcher in the lab of Carl June, MD, and in collaboration with Gill and Marco Ruella, MD, an assistant professor of Hematology-Oncology and a member of the Center for Cellular Immunotherapies, is the first to identify a possible cause: alteration in apoptotic pathways and death receptor proteins. The researchers validated their findings in mice, where tumors that had defects in undergoing death-receptor mediated apoptosis were highly resistant to CART therapy. Singh received an Abstract Achievement Award, and Ruella will receive the Joanne Levy, MD, Memorial Award for Outstanding Achievement for this abstract before it is presented. Research from Elise Chong, MD, a fellow in Hematology-Oncology, evaluates CAR T therapy followed by anti-PD-1 therapy in patients with relapsed or refractory B cell non-Hodgkin lymphomas. 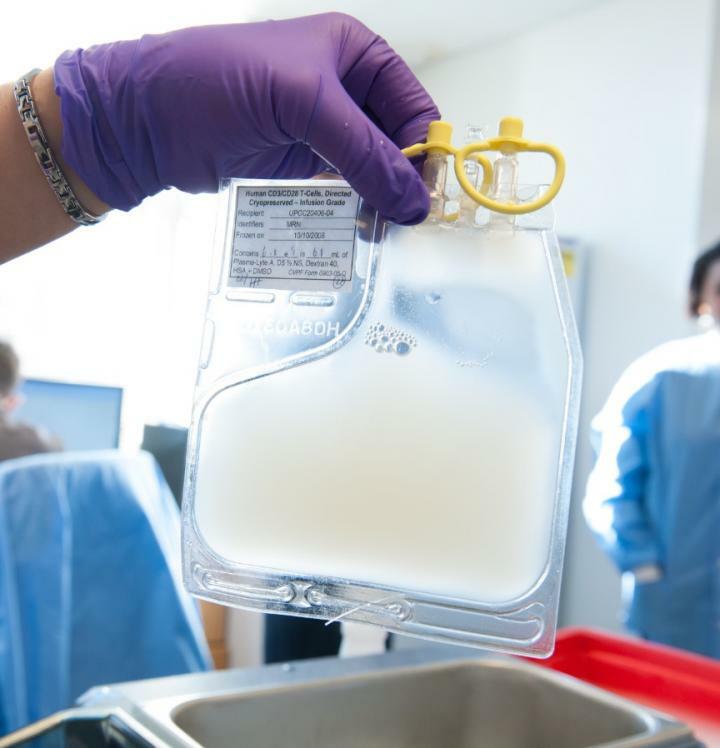 The study found the approach is safe, and the findings served as the basis for a multicenter clinical trial of CAR T therapy in combination with anti-PD-1 therapy that is currently ongoing.